Get a helping hand from a famous scientist! Oh, sure, it’s fun finding new elements, but sometimes it isn’t the act of discovery that drives a scientist. Sometimes it’s the heat of competition and being recognized as the best of the best of the best…of the best. Now players can team up with a famous scientists to assist in their lab work. Just keep in mind that the extra helping hand is offered only once. 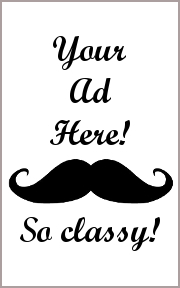 Use it wisely to gain the advantage and claim the prize! 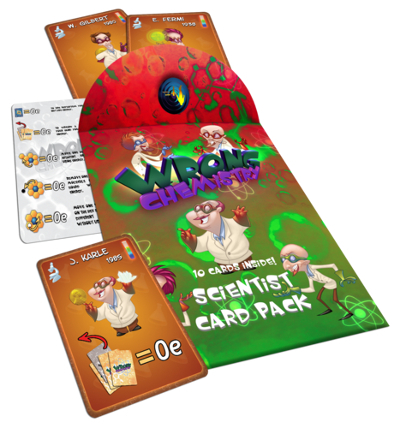 Wrong Chemistry: Scientist Expansion, designed by Tony Cimino and published by Mage Company, is an expansion to the card game, Wrong Chemistry. The expansion is comprised of 10 Scientist cards and 1 Scientist Special Ability reference card. Nine out of the Scientist cards represent individuals who were awarded the Nobel Prize in Chemistry. The tenth, Dr. Enrico Fermi, was awarded the Nobel Prize in Physics. Zero impact to the game, but it’s a fun bit of trivia. The game component quality is equal to the base game components in every way. Note that it’s assumed you are familiar with the base game. If not, please give our review a read or none of the following is going to make any sense to you. 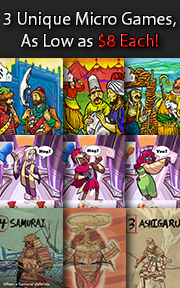 This expansion requires 1 additional step during game set up and introduces a new one time action during game play. 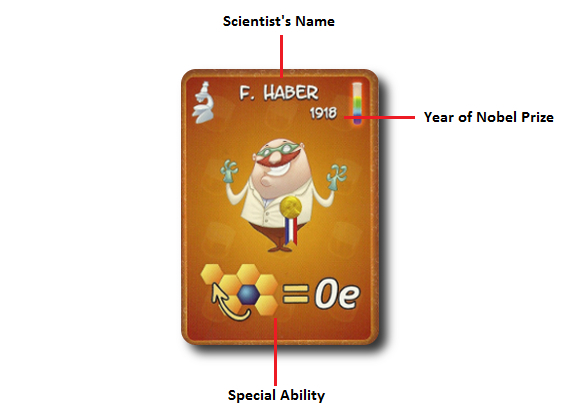 During game set up, allow the players to select one of the available Scientist cards and place it in front of them, face-up. Or deal out a Scientist card to each player at random. There is no “wrong way” to go about it, but the end result should be no more than 1 Scientist card per player. Place any unused Scientist cards back in the game box. When playing the game, a player can discard their Scientist card to activate the Scientist’s special ability. The special abilities are summarized here. I should note that the expansion doesn’t come with any instructions on how to use it. What I described above was pieced together after reading how the expansion was played using information found on Board Game Geek. That really annoyed me. And, yes, the game was given to me and I didn’t pay for it, but let’s call a spade a spade here. Not including the instructions on how to use a game expansion is lazy. But I digress. This is a review of the game expansion, not the lack of follow through in its delivery. The Scientists add a fun new twist to the game that was well received by the players who already enjoyed Wrong Chemistry, but did little to persuade the other players in our group to change their level of personal endorsement. The expansion could best be viewed as syrup on pancakes. If you don’t like pancakes, the syrup is going to do little to improve the overall experience. Still, a sweet addition often makes for a nice change to what is considered unpalatable. This is as true for syrup as it is for the expansion. Unfortunately, any excitement derived from the expansion was short-lived. What the expansion adds is a one time free action. How important that is to the game will only become known at the end of the game when a winner is declared. The Scientist cards add a means to a possible end, but do not provide any clear advantage or long-lasting effect during game play. Players can use or not use the expansion without doing much to change the game’s flow. In fact, I had to remind players they had the Scientist cards during the game because they were being ignored. It’s clear that the Scientist cards simply didn’t play that pivotal a role in the player’s thinking process. When they were used, they often allowed the player to score an Element card. The icons on the Scientist cards can be exceedingly difficult to understand at first. You’ll need to make certain to keep the Scientist Special Ability reference card out at all times. I made 3 copies of it so that each player had their own. This helped to remind the players what their Scientist card provided, but more importantly, what special ability their opponents had. Personally, I rather liked the expansion and enjoyed the extra special “scientific boost” ability the Scientist cards gave me. I also think it’s a much better expansion than the Wrong Chemistry: Element game expansion. It provides a neat little twist, albeit a small one, that shakes things up a bit. But, again, not much. If you already enjoy Wrong Chemistry, do grab this expansion. Tagged Child Geek Approved, Game Expansions. Bookmark the permalink.